18 kilometers away from the city of Bao Loc (Lam Dong) is a mighty waterfall of "Wait" (Dambri), roaring all day and night long. 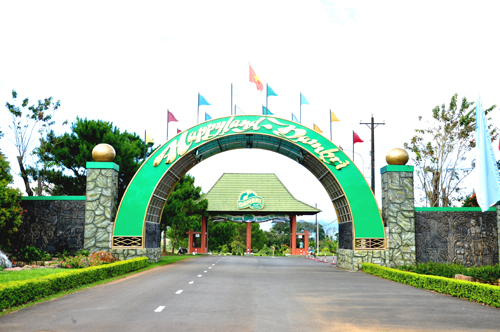 Bao Loc City is located 120 kilometers away from Da Lat City and 180 kilometer from Ho Chi Minh. To approach this city of interesting features, tourists have to spend a quite long routine among the clear blue sky and with clouds of a specific area of Central Highlands. 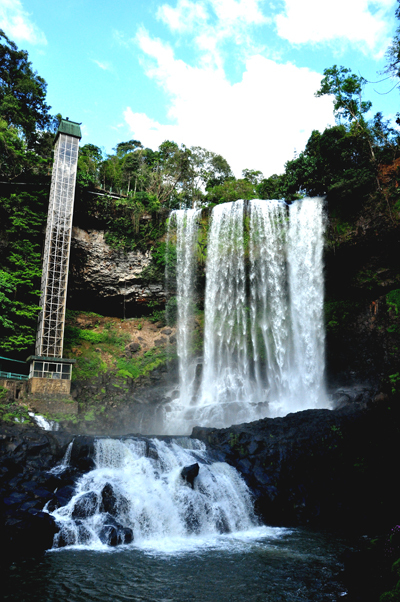 Dambri waterfall lies on the some-1,000-hectare tourist site of Dambri with its characteristic pristine beauty. Right from the entrance, tourists can hear clearly the fierce sound of pouring water. Your journey will begin with a quite winding track the waterfall foot. The mossy track is rather slippery, so that visitors should be careful on each step. Sauntering over some turns until reaching the feeling of tiredness, tourists can see the waterfall appearing out of a light drizzle with wet trees and plants around. Pouring down from a vertical height of 70 meters, Dambri waterfall looks like the soft hair of the whole forest. At the fall foot is a small bridge crossing the rock-top. Crossing the bridge, tourists will wallow in the non-stop miraculous drizzle made by millions of drops from the imposing waterfall. The fresh water has brought up surrounding trees and plants. 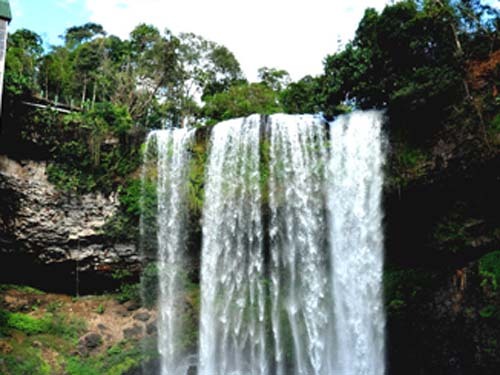 It's legendarily narrated by K'ho people (an ethnic community of Lam Dong) that the waterfall is connected with a moving love story. Particularly, at the fall foot had been sitting a nymph naively waiting and crying for her lover after their heart-breaking separation. Several seasons had gone but there was still no news of that man. Her stream of tears formed the waterfall of "Dambri" which means "Wait" in K'ho language. Tourists can visit a little cafe on the upper bridge to contemplate the panoramic view of waterfall and the pretty purple wildflowers growing through the rocks then skirt upstream along the trail through the forest. It will be faster to use the elevator of glass to enjoy the might beauty of nature, especially for those who cannot stand a long walk. Within the campus is also Monkey Island, Chau Ma ethnic village and Amida temple. These exciting destinations will be the perfect ending of a long, memorable trip around the tourist site of Dambri. 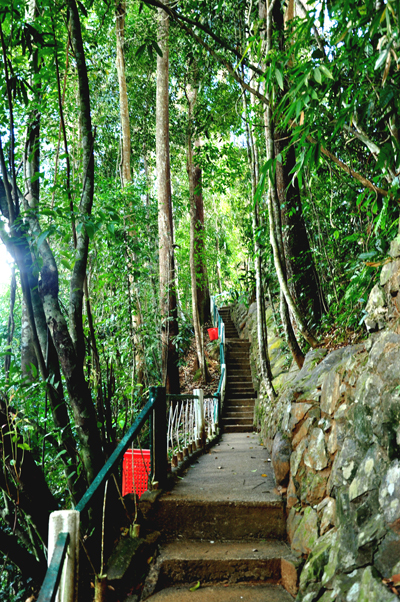 Dambri Falls is part of the eco-tourist complex has a total area of 1,000 hectares located in the pristine forests still kept pristine beauty.